We had a lot of fun making Sue’s foil stamped black and gold birthday invitations! The contrast between the matte black of the card and the bright and shiny gold of the foil really makes this lovely invite stand out. We also designed a cute matching black envelope with polka dotted gold inlay for it all to be packaged up in! Check out these exquisite holiday cocktail party invitations! 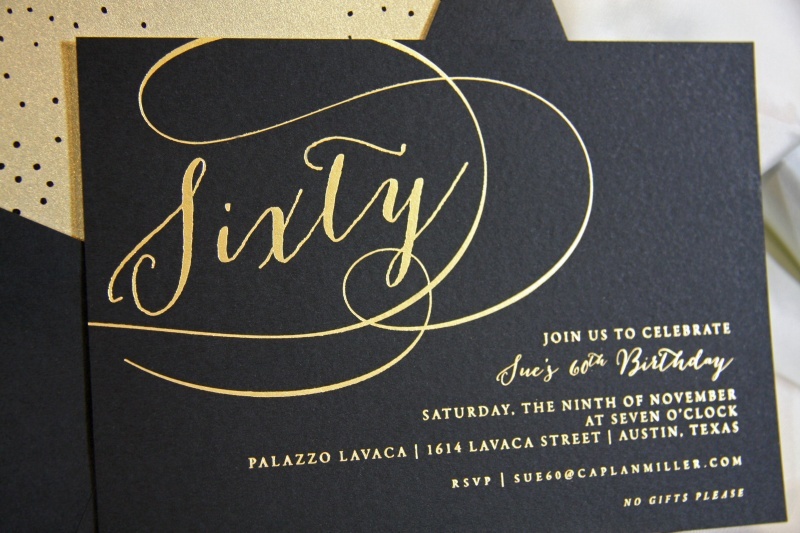 This beautiful two color gold and silver piece was made using a combination of letterpress and die cutting. The thickness of the paper used ( Crane’s Lettra 220 lb. c ) also really helps to make this cocktail party invitation feel important and special. Take a look at these custom letterpress Christmas cards that we made for the Phelps’. These cards were made using a digitally printed photograph and then we used a letterpress to create the wreath and text. Theres really nothing better than family photos and old fashioned letterpress to really bring out the holiday cheer. These letterpress holiday party invitations perfectly capture the feeling of the holidays from their chilly cool blue on white type, to the silvery foil of the snowflakes and text. Everything about this card makes me think about all my chilly winter nights, and the family and friends that I spent them with.